If you are a family new to hockey, WELCOME! This page is designed to help you with some basic questions that many first time hockey families have, but few ask. "This stuff is really expensive, right?" One myth about hockey equipment for beginners is around cost. 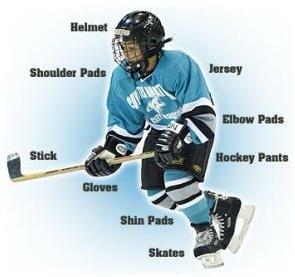 Outfitting a beginner with new equipment can be expensive, but there is also a good supply of used hockey equipment right here in Decatur. Used protective equipment is priced aggressively and is adequate for beginners. You can find used gear at a local retailer, DYHA has a limited amount of used equipment, and don't forget to check out the "exchange" page here on DecaturHockey.com for deals from other Decatur Flame families. If you have any questions please feel free to ask. "So, what do I need for my player?" Below is a pretty good guide for the different items you will need. Again - if you have ANY QUESTIONS please CONTACT a board member. There are no dumb questions!!! 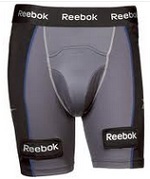 A jock protects the important parts (female hockey players use Jills). There are a number of different jock styles available, the old style garter belt jock, and the newer style velcro shorts. The velcro helps hold the hockey socks into place. Shin pads will protect the legs from the top of the knees down to where the skates start. It’s important to have proper fitting shin pads so there are no gaps between the skates and the shin pads. These go over the shin pads and then attach to the jock / jill either via velcro or the old style garter belt. Some players use clear tape to hold their socks up. Yes they are called hockey pants, even though they look more like shorts. The Pants protect from the knees up to the belly. It’s important to get proper fitting hockey pants so they are not sagging or falling off, but also not too small that they leave a gap between the shin pads and bottom of the pants. These are one of the most important parts of hockey equipment. A comfortable pair of skates is very important. In my opinion used skates are perfectly fine for beginners. They are already broken in and much more affordable! Shoulder pads protect the shoulders, biceps, chest, and upper part of the back. Some players prefer bulky shoulder pads while others prefer shoulder pads that barely protect anything (better mobility). For younger players I recommend shoulder pads that offer good protection, but make sure they are not too big that it restricts the child from moving. Elbow pads protect the elbows, as well as a bit of the forearm and triceps. The elbow pads are mainly for protection when the child falls. The neck guard protects the neck from the very rare chance that a hockey stick or skate blade comes in contact with the throat. A helmet is obviously very important. Take time to make sure the helmet offers a good snug fit. A full cage is also required to protect the face. A mouth guard is required to protect from dental damage and concussions. A mouth guard with a tether that attaches to the helmet is a wise choice! A very basic hockey stick is appropriate for beginners. Find an inexpensive stick, wrap some cool tape on the blade, and you're good to go. The stick's length is a consideration. You should cut the stick so when it's vertical it comes up to your player's chin when he/she is in skates. If you have any questions, ask your coach before you get out the saw! "OK - I have all of this stuff. Now how do I put it on?" Good question. On our first day of beginner hockey we showed up about 45 minutes early hoping an experienced player would be there to help. It was actually pretty easy. This is a short video that shows the process. Note this player is wearing long under-pants. Most players will wear a jock / jill that is short pants. Also, this player isn't wearing a neck guard. Neck guards are required by DYHA.